The black team took a hit this week with Phil receiving the final blow. Phillip Parham, 41-year-old real estate agent from Greer, SC, was sent home last night. Just last week, his wife Amy was sent home, so they didn't have to be apart from one another for very long. It wasn't too surprising to see Phil voted off. He was the newest member on the black team and I think Renee, Michelle, and Coleen thought he'd rather be home with his wife and three sons than continue on. 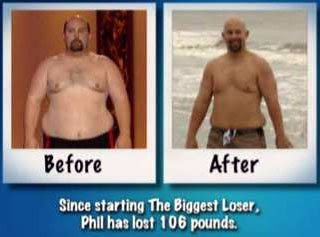 Phillip started The Biggest Loser weighing 331 pounds. Seven weeks later and 62 pounds lighter, he left the show weighing 269 pounds. Since being home, Phil has lost another 44 pounds and now weighs 225 pounds. Phillip's goal is to weigh 175 pounds at the show's finale. Prior to being on The Biggest Loser ranch, I would've dreaded coming to the beach, because I would've been afraid to take my shirt off. I would've sat out and watched the kids play. Now I kinda look forward to doing things because I kinda want to show myself off. I feel like now, I can be a role model for my children and I feel like they look at me in a new light. I think the whole family's benefited from this whole experience. My middle son, Pearson, since I've been home, he's lost 10 pounds and it's just exciting to see that things we've done have kind of inspired others. Amy: For me to see him out there active with them really makes me feel good because you know boys need their dad to play with them and do sports with them and things. I don't think anyone has ever loved a man as much as I love Phillip. It's really neat to see this change in him. I am so thankful that we did this together because we do everything together and getting healthy has brought us closer. I am so thankful for this experience. The way I go about life now, I think my kids are going to look at that and see me as the dad they've always wanted. If interested, you can watch Phil and Amy's profile video here. You can also watch Phillip's "Where Are They Now?" video here.